The Skater is an aerobic yoga-with-weights exercise that works the muscles of your buttocks. By the time you do this exercise twice, you’ll be huffing and puffing. The balancing aspect of this exercise fires and stimulates your brain’s nerve connections. Focus on inhaling and exhaling so you don’t do this exercise too fast and throw the weights. Keep your chest open as you inhale and exhale throughout this exercise. Stand with your feet below your hips, your toes pointing forward, and the hand weights at your sides with your palms facing backward. This is the starting position. Spread your toes wide, pressing hard into the ground through all four corners of both feet — your heels and your toes. You should actively engage both feet. Also, for support, draw your belly in and up and point your tailbone down. As you inhale to a count of four, lift the weights above your head while you bend your left leg for support and lift your right leg behind you as high as you can without losing balance. Lift your arms in front of your body until they reach the height of your ears. As you lift, sit back a little bit with your buttocks behind your heel. Feel your buttocks squeezing as your hips are parallel to the floor. Keep your leg behind you (don’t lift it to your side as a dog does beside a fire hydrant). As you exhale to a count of four, return to the starting position. Keep your chest open as you exhale. If you have trouble balancing, try using lighter weights, or do the exercise without the hand weights and rest your hands on your hips. 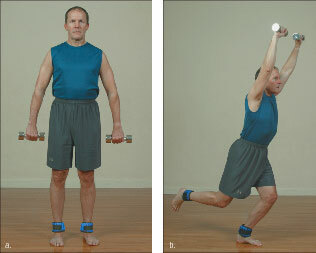 You can also do this exercise without the ankle weights. Alternating legs with each repetition, repeat this exercise six to eight times with each leg, pause to rest, and then do another six to eight repetitions with each leg. You’re imitating the gliding motion of an ice skater.